The Abu Dhabi National Oil Company (ADNOC) announced, today, the award of a dredging, land reclamation and marine construction contract to build multiple artificial islands in the first phase of development of the Ghasha Concession. 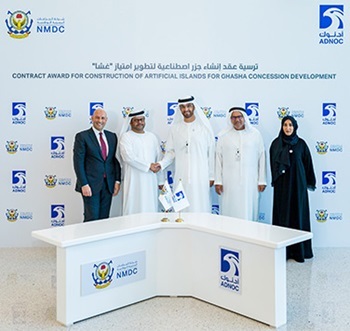 The contract awarded to the UAE’s National Marine Dredging Company (NMDC) is valued at AED 5 billion (US 1.36 billion) and will achieve substantial In-Country Value of over 70 percent. The Ghasha Concession consists of the Hail, Ghasha, Dalma, Nasr and Mubarraz offshore sour gas fields. As part of the selection criteria for the contract, ADNOC carefully considered the extent to which bidders would maximize In-Country Value in the delivery of the project. This is a mechanism integrated with ADNOC’s tender evaluation process, aimed at nurturing new local and international partnerships and business opportunities, catalyzing socio-economic growth and creating job opportunities for UAE nationals. The successful bid by NMDC prioritized UAE sources for materials, as well as the use of mostly local suppliers, manufacturers and workforce, resulting in a total local spend of over AED 3.62 billion (almost US 1 billion). NMDC will also work with international partners to deliver the project. H.E. Mohammed Al Rumaithi said: “We are proud of our partnership with ADNOC and to be awarded this exciting new mega-project. We are also very pleased at the contribution this project will make to the local UAE economy, to supporting ADNOC’s gas developments, and to progressing the UAE’s strategy to develop the maritime sector, in order to compete globally.